Our family’s secret to success? We take great pride in our barbecue and great care of our customers. Some things haven't changed since 1941 – our quality and passion for barbecue remains the same now as it was then. Other things have changed a lot however – now there are over 130 locations in 34 states! We owe all of our success to our customers and to our owner/operators who have become a part of our family. History Dickey's Barbecue Pit prides itself on authenticity, innovation and barbecue sauce, one store at a time. With roots in Dallas, Travis Dickey set out to perfect Texas-style barbecue. 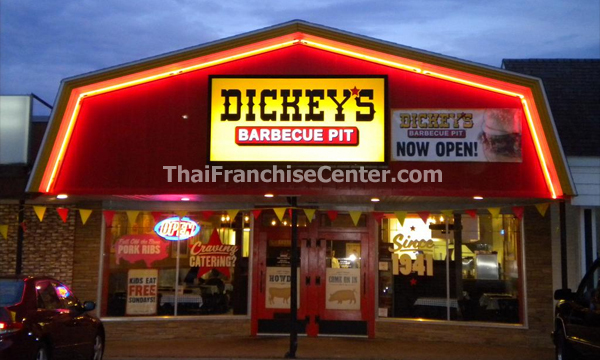 In 1941, Travis Dickey opened the first Dickey's Barbecue Pit in Dallas, Texas. Space on the restaurant's sign was rented out to help pay the start-up costs for the restaurant and the menu was limited to beef brisket, pit hams, barbecue beans, potato chips, beer, bottled milk and sodas. Investment Dickey's Barbecue has one of the lowest initial investments in the quick service industry. Our initial franchise fee is only $15,000 compared to some of the competition's initial fees that can range from $45,000 and up. There is no better time than now to begin a new career and lifestyle with Dickey's Barbecue Restaurants. of investor Taste why Dickey’s Barbecue has been the world’s best barbecue since 1941! Try our 8 juicy hot pit smoked meats, like our southern pulled pork or our family recipe polish sausage. We even offer 11 home-style sides, like our creamy cole slaw and fried okra. etc. Taste why Dickey’s Barbecue has been the world’s best barbecue since 1941! Try our 8 juicy hot pit smoked meats, like our southern pulled pork or our family recipe polish sausage. We even offer 11 home-style sides, like our creamy cole slaw and fried okra. Don’t forget-Kids Eat Free Sundays & everyone enjoys FREE every day! Dickey’s Barbecue. Seriously, Pit Smoked. Contact Dickey s Barbecue Restaurants,Inc.